Prehistory, meaning before history, is the span of time before recorded history or the invention of writing systems. It refers to the period of human existence before the availability of those written records with which recorded history begins. More broadly, it can refer to all the time preceding human existence and the invention of writing. See the fact file below for more information about prehistoric times. Prehistoric means the time before recorded history. The Earth is 4.5 billion years old, but humans have only walked on the planet for 190,000 years. The earliest living organisms were microscopic bacteria, which showed up in fossils as early as 3.4 billion years ago. Many things had happened in that time. The Earth formed and oxygen levels rose. About 800 million years ago, oxygen levels reached about 21 percent and began to breathe life into more complex organisms. The oxygen-rich ozone layer was also established, protecting the Earth’s surface from harmful solar radiation. The Paleozoic era gave rise to hard-shelled organisms, vertebrates, amphibians, and reptiles. 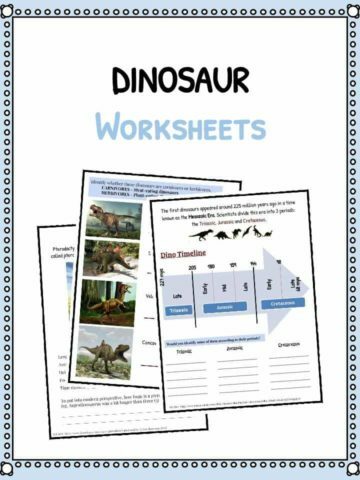 During the Mesozoic Era, dinosaurs ruled the Earth. 64 million years after dinosaurs became extinct, modern humans emerged in the Cenozoic era. Humans have really been on the planet for a fraction of the lifetime of the Earth. Archeologists estimate that modern humans have been on the Earth for about 200,000 years. They believe this occurred in the Middle Palaeolithic period in southern Africa. Humans are a member of a species of bipedal primates (this means they walk upright on two legs, which allowed them to use their hands) in the family Hominidae. Everyone on Earth is a homo sapien. This is Latin for the term, “wise human”. Humans have highly developed brains, a bipedal gait, and opposable thumbs, which allow the thumb to lock something into the hand like a tool or a weapon. 70,000 years ago, humans migrated out of Africa and began colonizing the entire planet. People spread to Eurasia and Oceania 40,000 years ago, and reached the Americas 14,500 years ago. One of the oldest sites of human settlement is located at Middle Awash in Ethiopia, where humans lived 160,000 years ago. 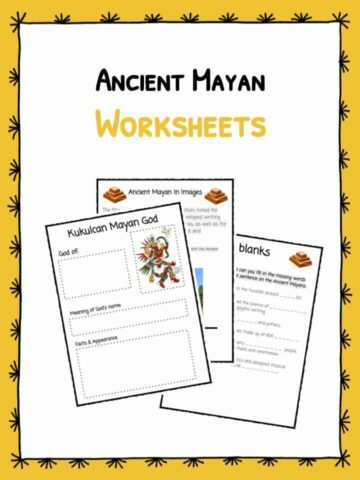 This bundle includes 10 ready-to-use prehistoric worksheets that are perfect for students to learn about the prehistoric era before recorded history or the invention of writing systems. Students will look at prehistoric tools and art to learn more about Earth before humans existed, and in the early years of human life. Students will complete the statements about prehistoric Earth by writing TRUE or changing the word to make it correct. This is a simple but fun word search that students will work through to find and circle all of the prehistoric words in the grid. 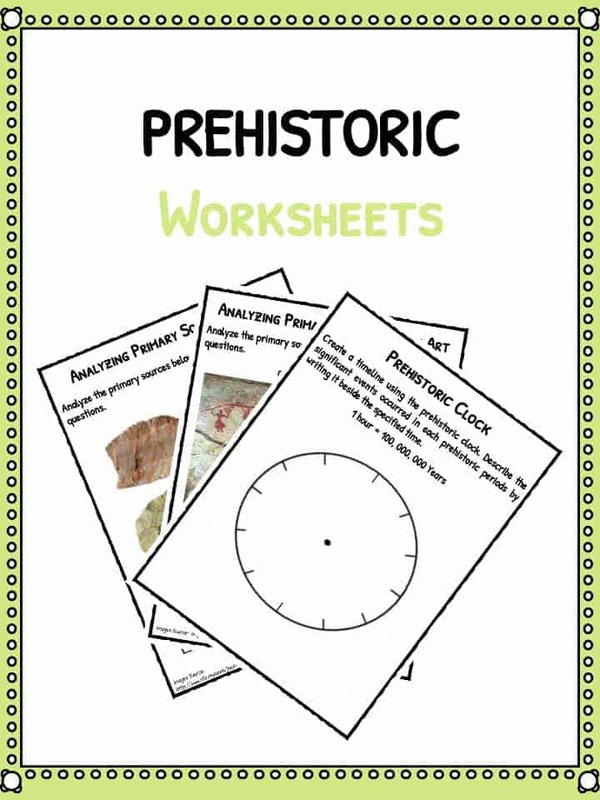 This activity is about creating a timeline using the prehistoric clock and describing the significant events in each prehistoric period. 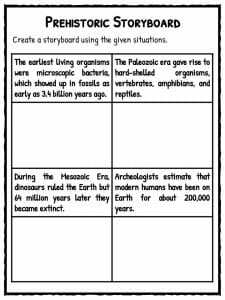 Using the given situations, the student will create a storyboard and illustrate the described events in the boxes provided. 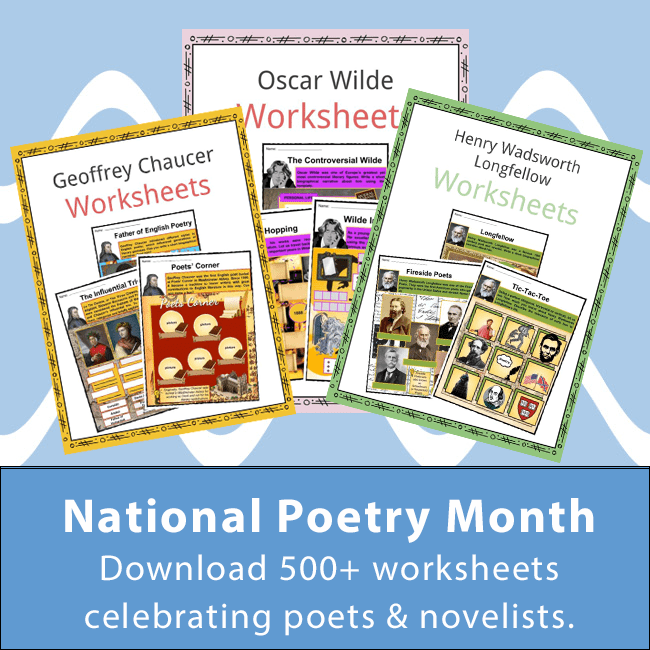 In this worksheet, the students are provided primary sources and will need to complete a writing prompt by answering the questions about them. 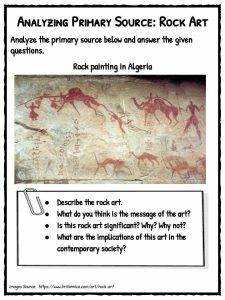 Similar the the prehistoric tools worksheet, this writing prompt will ask the students to answer a number of questions about prehistoric art. 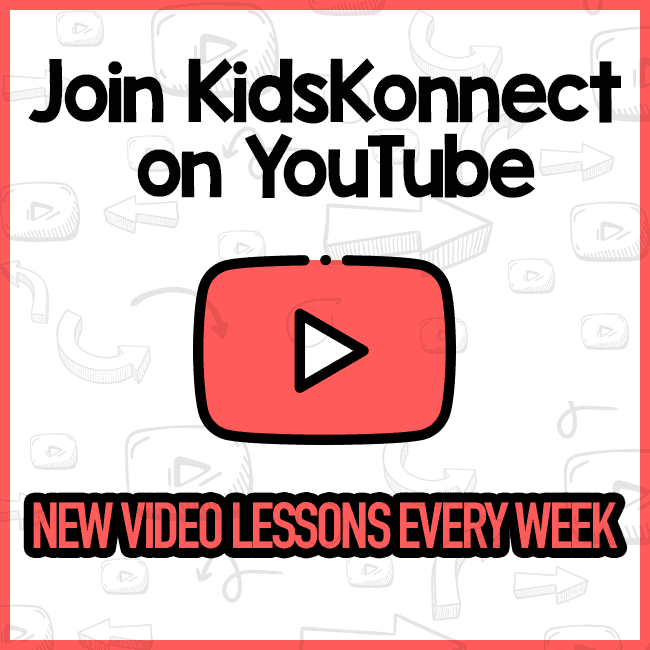 Students will create a caricature based on the geographical description during the Prehistoric Period and write a brief description about their piece. 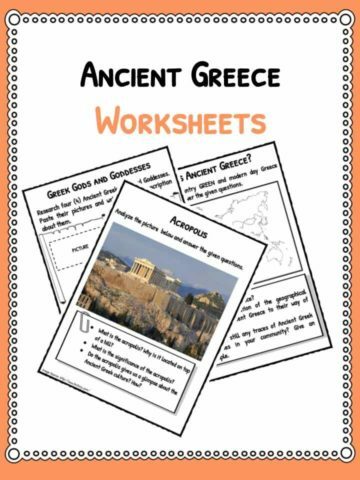 This worksheet requires the student to do their own research, write down their findings and plot their journey on the included map. In your local area, students will research a prehistoric site and analyze the culture of people from that time using the given guidelines. 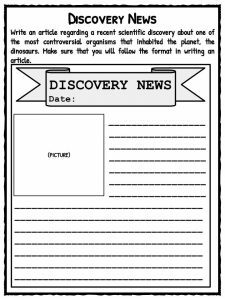 In this writing prompt, students will write about a recent scientific discovery about one of the most controversial organisms that inhabited the planet, the dinosaurs.